Updated 3/2017-- all links removed as many are no longer active and it's easier than checking each one. This edition (224) of SurgeXperiences is hosted by Karen, Just Up the Dose. You can read this edition here. As this is the first blog carnival I've ever hosted, the theme for this week is 'My First Time'. Thanks to everyone who sent submissions, and to those of you whose posts I've used without asking permission - thanks as well. Let's get cracking! The host of the next edition (225), June 14th, has not been announced. The deadline for submissions is midnight on Friday, June 12th. Be sure to submit your post via this form. This quilt top is a log cabin variation that produces curves by using two different width of “logs.” I made it with no one in particular in mind, but recently gave it to my cousin Gail. She was a rock of support this past few weeks. She had mentioned that our Aunt Earlene was going to help her learn to quilt. This will get her started. The top is 51 in X 66 in. Here are two photos to show off some of the fabrics. My mother died last Tuesday. She had her coronary bypass surgery just one week before that day. It was during her CABG that she had her strokes. Yes, strokes, plural. She was one of those 1.5% who suffer macroemboli cerebral strokes during coronary bypass surgery. I went looking for information on it earlier this week. I went through my training without ever seeing this complication. Like everyone, I never thought my family would be the one. I think it is better to go to surgery, NOT thinking you will be the “statistic” as far as complications go. Anyone having surgery, SHOULD go into it feeling hopeful and thinking everything will go perfectly. The article referenced below is a good review of this complication – stroke during coronary bypass surgery. The study is a retrospective review of 6682 consecutive coronary bypass patients who only had the CABG procedure and not other simultaneous procedures, such as carotid endarterectomy. First, the ascending aorta is the site of surgical manipulations during CABG, whereas mechanical contact is not made with the other potential sources of emboli. Embolization of atherosclerotic debris is most likely to occur during aortic cannulation/decannulation, cross-clamp application/removal, and construction of proximal anastomoses. However, embolization of atherosclerotic debris may also occur when the aorta is not being surgically manipulated, due to the ‘sandblast’ effect of CPB. Second, the majority of our independent predictors of stroke – elderly age, left ventricular dysfunction, previous stroke/TIA, diabetes, and peripheral vascular disease – are strongly associated with atherosclerosis of the ascending aorta. Third, our chart review suggested that the most common probable cause of stroke was atherosclerotic emboli from the ascending aorta. Palpable lesions in the ascending aorta were noted in a large proportion of stroke patients. The fourth reason we believe the ascending aorta is the likely source of macroemboli is because of ancillary autopsy data. ……. Note the second reason given above – the independent predictors of stroke. My mother was over 74 yr so fell into the elderly age risk factor group. She was also a type 2 diabetic. 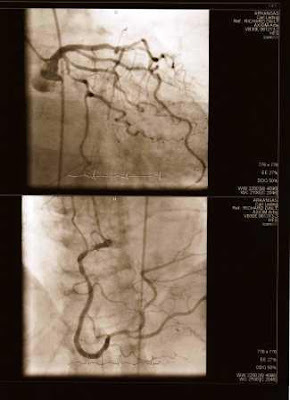 She was noted to have a small abdominal aneurysm and some renal artery stenosis on the angiogram (an accidental pickup). So she had three of the four independent risk factors. Arkansas, like many other parts of the country, has had lots of rain over the last month. Many areas have suffered flooding. The farmers have had difficulty getting their crops planted. All this heavy rain is perfect for one thing -- mosquitoes to lay their eggs and breed. So while the farmers may suffer a reduced crop, there will most likely be an explosion in the population of the mosquitoes in the next few weeks. The increase in mosquitoes may mean an increase in the diseases they carry, like West Nile. Mosquito Control authorities advise residents to make sure there isn't any standing water near their homes. If there is something in the yard that collects water, empty it every time it rains. The Center for Disease Control and Prevention (CDC) recommends the use of mosquito repellents with DEET, Picaridin, oil of lemon eucalyptus, or IR3535 as the active ingredient. DEET and Picaridin are characterized as “conventional repellents” and Oil of Lemon Eucalyptus, PMD, and IR3535 as “biopesticide repellents”, which are derived from natural materials. For more information on repellent active ingredients go here. Do not apply to eyes or mouth, and apply sparingly around ears. When using sprays, do not spray directly on face—spray on hands first and then apply to face. Note the label for products containing oil of lemon eucalyptus specifies that they should not to be used on children under the age of three years. Other than those listed above, EPA does not recommend any additional precautions for using registered repellents on children or on pregnant or lactating women,. For additional information regarding the use of repellent on children, please see CDC’s Frequently Asked Questions about Repellent Use. See First is this week's host of Grand Rounds. You can read it here. Blogs make it possible for these voices to be heard, and we’re very fortunate to have a great variety of blogs and bloggers to feature in this edition of Grand Rounds. These stories and these people need a more prominent place in the public mind, and I’m hopeful I can play a small part in that with this week’s edition. The submissions this week come from as far away as Australia, South Africa and the UK, and as close to home as my hometown. But on the web these are all local calls, so I’ve categorized the more than 2 dozen submissions this week into a few topics. Better Health featured a post by Dr Charles Smith on Ten Tips for Overcoming Your Headaches. The tips are from my classmate, Dr Lee Archer. Check them out. 1. First and foremost, taking pain medication everyday is definitely not a good idea. Daily pain medication tends to perpetuate headaches. This is true for over-the-counter medications like Excedrin and BC powders, as well as prescription medications ……. Check out MedGadget’s 1800s Surgical Kit – Unboxing (photo credit). To help us on our voyage through the kit, Medgadget has enlisted our friend Dr. Laurie Slater, whose website Phisick showcases a formidable collection of medical and surgical antiques. Being more knowledgeable on such matters than us, he has kindly offered to act as our guide. From the confines of this post / interview, we'll explore the surgical kit, touch on surgery in the 1800s, and get you thinking about the days when you'd probably dress like these gentlemen. This week Dr Anonymous will be discussing Podcamp Ohio this week. I hope you will join us. The show begins at 9 pm EST. We buried my mother last Friday, May 22, 2009. I find myself moving through each day trying to get things back to normal, but unsure I will ever accomplish that goal. I was never very good at picking up the phone to call my mom though I did on her birthday and on holidays. I was good at writing her notes. Over the past several years I have written her at least one note/letter each month and an e-mail now and then. My father died when I was only eight, so I have some experience with grief. Still this is different, magnified. I am now an orphan. I would add that these articles might be a “must read” for any of us who are grieving for our mothers, fathers, brothers, sisters, etc on this Memorial Day or any other day. Updated 3/2017-- photos and all links removed as many are no longer active and it's easier than checking each one. The SurgeXperience 224 will be hosted by Karen, Just Up the Dose, on May 31st. The deadline for submissions is midnight on Friday, May 29th. Be sure to submit your post via this form. If you haven’t read her blog yet, you need to check it out. Here is a small sample of a recent post "it could be worse"
...if you think you're having a bad day. Yesterday, an unbooked lady* came in to labour ward and promptly delivered a pair of slightly premature, low birth-weight twins. Surprise! Once she was cleaned up, the labour ward sister did her booking bloods, and it turns out she has syphilis. Surprise surprise! After that, we got the pret-test counsellor in and... you guessed it... she has HIV as well. Surprise surprise surprise! Here is another Quilt of Valor Foundation (QOV) quilt top. This one is a “tactile” top. It is made of denims, flannels, chenille, velvet, and cotton. The top allowed me to use some fabric scraps. The quilt is machine pieced. It measures 50 in X 60 in. There are actual pockets which I hope the long-arm quilter will be able to leave functional. Updated 3/2017-- photo and all links (except to my own posts) removed as many no longer active. and it was easier than checking each one. My mother died peacefully Tuesday, May 19, 2009, in the presence of some of her family. We were fortunate to have had a lovely Mother’s Day with her. We had given her a digital camera which she was so very excited about learning to use. Her grand-daughter Krystal showed her the basics while we ate lunch together. She promptly took some photos at the restaurant table. The next morning she was trying to take photos of birds at her bird feeder when she had her heart attack. This past week while attending her “deathbed” at the hospital, family and friends came and went, sharing wonderful stories about her and us. It was a time of grieving, but also of celebration of her life. We have continued to try to do so as we have gone through the steps of planning the funeral. We are so very grateful to all our extended family, friends, co-workers, etc who have held us in their thoughts and prayers. Thank you. You can read her obituary here and my previous posts here and here. I caught this story on ABC Good Morning America Tuesday while sitting with my mother. Life is often tough, isn’t it and Hannah Powell-Auslam, 10 years old, is finding that out early. It is estimated that at least 180,000 women will be told by their doctors this year that they have breast cancer. Most of these women are over 30 years old. As Hannah’s mother Carrie Auslam told reports from KCAL-TV in Los Angeles. "Ten-year-olds don't get breast cancer." So now 10 year old Hannah has to face a disease which woman 4 times her age find difficult to face. It is a time when she should simply have to worry about which clothes to wear and what music to listen to and which movie to see. The family has a Web site documenting Hannah's fight against her cancer. She has undergone her breast surgery. It is most likely that she will have to have chemotherapy. I wish her well. Healthcare Technology is this week's host of Grand Rounds. You can read it here. The latest edition of Change of Shift (Vol 3, No 23) is hosted by Kim over at Emergiblog! You can find the schedule and the COS archives at Emergiblog. Welcome to Change of Shift, the blog carnival by, about and for nurses! If you would like to take the helm of a future Change of Shift voyage, please send a message (see contact button above) and the Communications Officer will schedule a date for you! Like the latest Star Trek movie, this edition of Change of Shift will make you smile and get you all riled up at the same time! But enough about my delusions of Star Fleet, on with the main attraction! This week Dr Anonymous will be discussing Blog World Expo. I hope you will join us. The show begins at 9 pm EST. Last summer I wrote a post on Comfort when my friend’s dad died. This past week my family and I found ourselves on the receiving end. Our family and friends have gathered around us. It is amazing to me, especially those of you who I have not even met in person. Thank you for your thoughts and prayers. I don’t think I can express what you all mean to me. This edition (223) of SurgeXperiences is hosted by T, Notes of Anesthesioboist. You can read this edition here. In anticipation of the upcoming release of Terminator Salvation, the loose theme of this collection will be "Man and Machine." When I use the term man here I'm referring to humanity in all its facets - flawed or perhaps even evil at times, but also noble and capable of surpassing goodness. The host of the next edition (224), May 31st will be Karen, Just Up The Dose. The deadline for submissions is midnight on Friday, May 29th. Be sure to submit your post via this form. I continue to make quilt tops for the Quilt of Valor (QOV) Foundation. 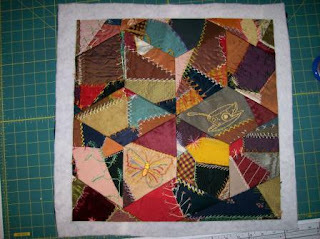 Here is the latest -- a simple nine-patch with sashes and border. The top is machine pieced. It measures 52 in X 68 in. The 12 in blocks are navy and white. The 2 in sashing is from two different tans. 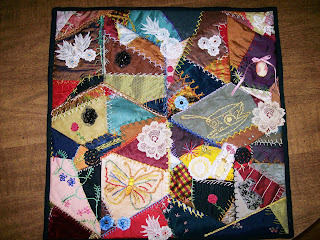 I’ll be sending it off to a long-arm quilter who will finish the quilt and mail it on to a recipient. Those of you who follow me on twitter know that my mother (74 yo) had a heart attack on Monday. She was seen quickly in a small rural hospital who gave her a “clot-busting” drug which open her right coronary artery back up and prevented/minimized any heart muscle loss. She was then air-evaced to the Arkansas Heart Hospital in Little Rock where she had an angiogram under the care of cardiologist Dr. Carl Leding. For someone who has been “asymptomatic” it is amazing how much blockage she has! 80-90% in the RT coronary near it’s origin and another 50% in one of it’s branches, 70% in the left main coronary before it gives off the anterior descending branch, and 70% in the circumflex artery. She has a history of hypertension and type 2 diabetes. She quit smoking in 2002. Her mother died of a stroke. Her father of heart disease. Her only sister died of a rupture cerebral aneurysm. Fortunately, she loves to dance and that has kept her active. Tuesday, Dr Charles Watkins (CT surgeon) did her CABG -- a 4 vessel. All went well with the surgery, but she failed to "wake up" postop. So just after noon Wednesday a CTscan of her head was done. She had multiple small and large areas of non-hemorrhagic stroke, some old and other new. This morning she is to have an EEG and then the neurologist will see her. I hope he tells me that Dr Watkins and I are wrong and that all will be well. That is not likely. I want to thank all involved in her care. I think they have done a marvelous job. I also want to thank everyone who has kept my family in their thoughts and prayers. They are much appreciated. We can’t (yet) change our genetics, but our family history can give us warnings to change or improve our habits. You can tell by my mother’s history above that my own family history is heavy with heart disease and hypertension (several siblings have HBP). I own up to this history. I try to walk daily, but should pick up my pace and make it more aerobic. I try to keep my weight down to avoid type 2 diabetes. I try to limit my caffeine to 2 cups per day. I need to make my diet more consistent with the DASH diet (pdf). I have cut back on my salt intake, but could do better. I eat fruit and vegetables, but could do better. I don’t eat red or processed meat on a daily basis, but could add more fish to my diet. I am fairly good at the whole grains. I don’t smoke. I have a major sweet tooth which I have to fight. I most likely need to check my blood pressure weekly rather than monthly. It has always been normal, but the day of my mother’s surgery it was not. Despite all the “right” things we may do to avoid disease such as heart disease, sometimes it finds us anyway. Check out Denver Doc’s recent post (Heart Attacks and Low Cholesterol) about a patient with almost perfect “numbers” who had a heart attack. Two lessons here: prompt access to modern medicine is grand, and none of us can rest assured in our low cholesterol numbers. This is a repost of last year’s “poison ivy warning” with a few changes. Enjoy your walks and play time outdoors, but be careful. I love to walk in the woods with my dog. I am lucky to have a neighbor who has a trail through her woods around her pond that she encourages us to use. This time of year I have to watch out for poison ivy. In the picture here you can see the poison ivy (leaves of three) intermingled with some Virginia Creeper (five leaves). I find both very pretty. If you are like me, then you may wish to check out this product, Zanfel, that Dr Paul Auerbach wrote about recently. Zanfel™ is a soap mixture of ethoxylate and sodium lauroyl sarcosinate surfactants. When "activated" (worked into a paste that can be spread effectively on the skin), the soap is able to bind urushiol and thus allow it to be removed from the skin by rinsing. Health Blogs Observatory is this week's host of Grand Rounds. You can read it here. Welcome to the Grand Rounds Diversity Edition, Vol. 5 No. 34 - where we celebrate the differences that make the health/medical blogosphere so beautiful and rich. If this is your first visit to the Health Blogs Observatory, please feel free to look around and explore. Consider submitting your blog to our directory, to gain better exposure and participate in our future research. We are conducting open research of the health/medical blogosphere and would be delighted if you would consider joining us. We wish to dedicate this edition of the Grand Rounds to Florence Nightingale who was born on this day, May 12, 189 years ago. The Journal of Supportive Oncology (my favorite free journal with excellent practical palliative care articles) published a fantastic review of taste and odor dysfunction in cancer patients. If you read this article you could become a local expert because so few clinicians appreciate the implications or understand the treatment options for these significant quality of life markers. Obviously with this kind of endorsement it qualifies as a teaching file article. Dr David finally blogs about Mike and I’m glad he did. What a great story! What a wonderful week for Mike (and those around him)! You really need to go over and listen to Mike play and sing. It’s been a good week for Mike………. Mike is a really cool kid. He plays guitar. No... I play guitar. Mike performs and makes records……. This week Dr Anonymous doesn’t seem to have a guest, but he always finds something interesting to discuss so I hope you will join us. The show begins at 9 pm EST. You can check out the archives of his Blog Talk Radio show. Being a plastic surgeon, I have a great interest in the skin and no I don’t see or treat much dermatitis as the primary physician. Patients do occasionally ask me about patches / rashes they have. It’s always nice to be up on the topic and to know when it’s important to make sure they see a dermatologist. The article listed below is a nice, simple review of conditions that fall into the eczema / dermatitis categories. The article discusses atopic dermatitis (AD), nummular (coin-shaped)eczema, contact dermatitis, and stasis dermatitis. It is not a deep article on the subject, but did include some nice reminders and tips. The article points out that allergic dermatitis is not uncommon in patients with chronic wounds. They site an article which documented more than 51% of leg ulcer patients acquire contact allergic dermatitis to local dressings and other topical treatment. This is important to any of us who treat wounds, acute or chronic. Sometimes the wound fails to heal due to this. There is a nice table which lists the common allergens in patients with chronic wounds. If your chronic wound patient has a contact allergy to these products, it can certainly complicate their wound healing. Avoid wearing wool or nylon next to their skin as they may exacerbate itch. Choose materials made of cotton or corduroy which are softer. Rather than use fabric softeners and bleach, which may be irritating to the skin, add a white vinegar rinse in the washing machine rinse cycle cup/dispenser to remove excess alkaline detergent. Keep water exposure to a minimum. Use humectants or lubricants regularly to replenish skin moisture. Apply these agents immediately after bathing while the skin is damp. For severe hand eczema, cotton gloves may be worn at night to augment the moisturizing effect of humectants and other topical treatments. Topical steroids continue to be the mainstay therapy for treating dermatitis. Topical steroid creams can be kept in the refrigerator or combined with 0.5% to 1% of menthol (camphor and phenol are alternatives) to give a cooling effect. This often helps. Treat the dermatitis with a topical steroid when the skin is red and inflamed. Tapering the topical steroid use by alternating with moisturizers as the dermatitis resolves. Remember that percutaneous absorption of topical steroids is greatest on the face and in body folds. They suggest only weak or moderate preparations be used in these areas. Moderate to potent topical steroids should be used on the trunk and the extremities. The SurgeXperience 223 will be hosted by T, Notes of an Anesthesioboist, on May 17th. The deadline for submissions is midnight on Friday, May 15th. Be sure to submit your post via this form. I first saw this pattern over at Swooze’s Quilts. She calls it “blooming nine-patch.” I love the way the colors blend and mingle together. I plan on using this again (and again). This one is 42 in X 42 in. I used up fabric left over from making a dress (the yellow) for another little girl and a previous quilt. This quilt is for the TJ’s daughter who is a fan of pink. Here is a close photo of the center. The quilt is machine pieced and quilted. And another of the edges. 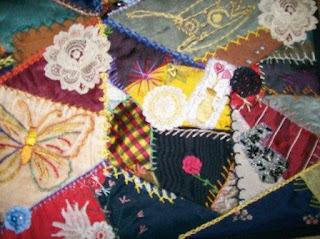 Here you can see the “hearts” used in quilting the solid blocks. The U.S. Food and Drug Administration recently announced that safety label changes including a boxed warning and a Risk Evaluation and Mitigation Strategy (REMS) will now be required for all botulinum toxin products. The agency took the action because of two main reasons. The first one is the potential for serious risks that may occur from the spread of the botulinum toxin beyond the injection site. The second reason is associated with the lack of interchangeability among the three licensed botulinum toxin products. When the botulinum toxin spreads beyond the area of injection, symptoms similar to botulism may occur. These symptoms include unexpected loss of strength or muscle weakness, hoarseness or trouble talking, trouble saying words clearly, loss of bladder control, trouble breathing, trouble swallowing, double vision, blurred vision and drooping eyelids. This “spreading effect” has been reported in both children and adults. It has been reported most often in children with cerebral palsy being treated with the products for muscle spasticity. Treatment of muscle spasticity is an off-label use of the drug. The “spreading effect” has been reported in patients being treated for both approved and unapproved uses. Dysport (abobotulinumtoxinA), a new FDA-approved product marketed by Ipsen Biopharm Ltd.
All are approved by the FDA for the treatment of cervical dystonia. Botox Cosmetic and Dysport are approved by the FDA for treatment of glabellar frown lines. Botox is approved for the treatment of severe underarm sweating (primary axillary hyperhidrosis), crossed eyes (strabismus), and abnormal tics and twitches of the eyelids (blepharospasm). All other uses are considered off-label. The FDA has not identified any definitive serious adverse event reports of a distant spread of toxin effect producing symptoms consistent with botulism when these products are used in accordance with the approved label. It is important for those of us who use botulinum toxins to remember that the dosage strength between the products is not the same. One unit of Botox is not equal in strength (potency) as one unit of Myobloc or Dysport. Dilution Technique: Using a 21-gauge needle and an appropriately sized syringe draw up a total of 2.5 mL/100 Unit vial or 1.25 mL/50 Unit vial of 0.9% sterile saline without a preservative……. Using a 30-gauge needle, inject a dose of 0.1 mL into each of 5 sites, 2 in each corrugator muscle and 1 in the procerus muscle for a total dose of 20 Units. Typically the initial doses of reconstituted BOTOX® Cosmetic induce chemical denervation of the injected muscles one to two days after injection, increasing in intensity during the first week. The recommended initial dose of MYOBLOC® for patients with a prior history of tolerating botulinum toxin injections is 2500 to 5000 U divided among affected muscles. Patients without a prior history of tolerating botulinum toxin injections should receive a lower initial dose. The duration of effect in patients responding to MYOBLOC® treatment has been observed in studies to be between 12 and 16 weeks at doses of 5000 U or 10,000 U. The units of Dysport are specific to the preparation and are not interchangeable with other preparations of botulinum toxin. The dosage is dependant on the severity of the lines and the specific muscle being treated. Improvement of severity of glabellar lines generally occurs within 72 hours after treatment and persists for 3 to 6 months. It is important for us to educate patients and their caregivers of the potential adverse effects. Some of these effects have been reported as early as several hours and as late as several weeks after treatment. Patients should seek immediate medical attention if they develop any of these symptoms -- unexpected loss of strength or muscle weakness, hoarseness or trouble talking, trouble saying words clearly, loss of bladder control, trouble breathing, trouble swallowing, double vision, blurred vision and drooping eyelids. Last evening, as I watched the ABC Evening News I was mesmerized by Connie Culp. She is still not the physically beauty she was prior to her 2004 gun shot injury to her face, but what an amazing woman! Culp, 46, received the first U.S. face transplant in December 2008. The 22 hour procedure took place at the Cleveland Clinic. At the time nothing was revealed about the patient. Yesterday, she came forth and stepped in front of the camera at a Cleveland Clinic press conference. The gun shot wound, inflicted by her husband, in 2004 had removed most of her mid-face, leaving her forehead and chin area, but taking her nose, lips, palate, and maxilla. With no bony or soft tissue to support up upper airway, she breathed through a tracheostomy (a surgical opening in her neck). The palate and soft tissue loss made it difficult to speak. I was impressed with her soft voice and poise. She is still learning to speak so not all of her words are perfectly articulated, but her speech is clear enough. She reports that she can now smell. She is now able to eat foods that require chewing such as hamburgers and pizza. Before the surgery she was only able to drink through a straw. She laughs easily with joy. Culp, a mother of two, focused on her gratitude, "I want to focus on the donor family that allowed me to have this Christmas present." She asked the public to have empathy for people with facial disfigurements. "When somebody don't look as pretty as you do, don't judge them," she said. "You don't know what might happen to you. Don't judge the people who don't look the same way as you do. You never know when it may be taken away from you. Her new face has given her the ability to be in the public with less judgment than before. She recalled how children where often scared by her old face. Dr Siemionow, the head surgeon, noted "The last resort and the last option was to consider face transplantation." Transplant recipients have to take immunosuppressing, anti-rejection drugs for the rest of their life. Those issues must be stressed. My friend Lisette who died of ovarian cancer last year is being honored by her hiking buddy Ellen Lowitz and other friends with the first (hopefully to be annual) Hope Hike 2009. This spring another friend and colleague, Yoland Condrey-Tinker, died of ovarian cancer. Both are missed. What: Hope Hike 2009 -- “Shout It From the Mountain!” -- A Memorial Hike to Benefit Ovarian Cancer research, in memory of the life of Lisette C. Johnson, 1952-2008. When: Saturday, May 9, 2009. Check in 8:00 am; Kick-off ceremony 9:00 am. Hike ends at 2:00 pm. Who: Hikers, walkers, runners, cancer survivors, family, friends, loved ones, leashed pets & owners, & other supporters are invited to participate. Where: Pinnacle Mountain State Park. Registration, check-in, & opening program at park’s West Summit Pavilion. How: Hike, walk, or run the Pinnacle Mountain trail of your choice. Choose from 8 trails in varying lengths or be a virtual hiker. Register: Free 2009 registration –‘09 Hike registration fees are waived. Donations accepted and appreciated. Register 3 ways: Register online; down-load the registration for, complete, and mail; or complete registration form and submit at check-in on day of hike. For more information about how you can get involved with Hope Hike contact them at HopeHike@gmail.com or at (501) 224-0636. NurseAusmed is this week's host of Grand Rounds. You can read it here. Welcome to Nursing Handover! This is my first time hosting Grand Rounds. I hope you enjoy your weekly medblog binge! I’ve chosen to present this week’s rounds without a theme, although a suggested topic for those with blogger’s block was “best (or worst) experience with inservice training, clinical education or CME”. All submissions have been included, with the best (in my highly subjective judgement) featured. Here at Nursing Handover I’ve been displaying some of the interesting images available under the Creative Commons licenses with posts. I’ve featured some more particularly evocative photography here. The latest edition of Change of Shift (Vol 3, No 22) is hosted by Gina over at Code Blog: Tales of a Nurse! You can find the schedule and the COS archives at Emergiblog. Happy Spring everyone! Welcome to this edition of Change of Shift. I typically do not ask for themed submissions, but I did this time. The theme of this CoS is being human - describing those moments of human error or letting our less-than-professional side show. I described my own less-than-professional moment here. Yes, it’s an old post, but relevant to theme. Dr Isis, On Becoming a Domestic and Laboratory Goddess, has begun a project I will be watching and reading with interest "The Letters to Our Daughters Project". Thinking I will forward them to my nieces, hoping to inspire them. It's not a secret that the largest attrition among female scientists happens in the transition between trainee and faculty. I also think that, for better or worse, there are things that are unique to being a female scientist that affect the ability/willingness of women to pursue careers in science. ………. The first letter is from Dr Pascale Lane. Kim, Emergiblog, writes about the new Showtime series, Nurse Jackie, in her post Negative nurse stereotype promoted by Showtime in attempt to capture House MD ratings? They made a show with a strong nurse protagonist, and damn! if they didn’t get the ER environment down! I was ready to (a) start getting Showtime, (b) spread the word far and wide and (c) take the job. JSE Booth, The Scut Report, has a nice list of references related to reading chest x-rays. I like chest x-rays. They make me feel warm and fuzzy inside. So much so, in fact, that I’ve created this nifty little reference sheet. Please note, however, that I am not a radiologist nor do I play one on TV. In fact, at the time I am writing this, I’m not technically a doctor yet. One more month. ………. Check out this link from “A Repository for Bottled Monsters” in their post – Paper Cutting Wow! Amazing work! This is a paper cut by American artist Hunter Stabler called "Baba Yaga Misquotes the Face to Steeleye Span." Not all of his work is anatomical, but it's all fantastic. What skill and patience. Early in my blog life, I did an article on torn earlobe repair. As I mentioned then, I had not figured out how to put sketches in my posts. Over the past two years, I have learned how to add them, so am redoing the post with sketches. I hope they help. Not wearing heavy ear rings. Being careful when putting on or removing clothing so as not to "catch" the earring. Being careful around babies/toddlers who want to play with shiny/dangling objects can help prevent the lobe from being torn. Use the "earlobe support" which is a stick-on disc that help support the earlobe when heavy earrings are worn. Once the stretching occurs or the tear is completed, then the only way to fix it is to repair it. For me, this is an office procedure done using a simple local block. I mix 0.5% Xylocaine with Epi and 0.25% Marcaine without Epi. There are variations on "how" this is done, but they all require excising (freshing) the edges so they can be sewn back together. The variations are mainly in how the excision is structured–straight, z-plastied, or L-shaped. I do not think the straight excision is the best way to do the repair. If the scar "shortens" at all (as straight scars are prone to do), then the lobe is "gathered" up and ends up "W" shaped at the bottom. Another reason is that unless you (the patient) are very good at repositioning the new hole to the side (either) of the scar (which is weaker by at least 20% of the surrounding skin), the tear is very likely to re-occur as the earrings pull-through the scar over time. The Z-plasy or L-shaped scar avoid the "W" by changing the scar into a non-straight scar. Which one is best will depend on the tear and shape of the earlobe being repaired. Also, it may depend on whether there is an intention to re-pierce the earlobe. Not all do. Another alternative to pierced ears is magnetic Earrings. Most insurances will not cover this procedure as they consider it cosmetic in nature. REPAIR OF THE SPLIT EARLOBE USING A HALF Z-PLASTY; Journal of Plastic & Reconstructive Surgery, Vol 101(3):855,856, March 1998; Gajiwala, Kalpesh M.S., M.Ch. Dr. Michael Bermant, MD ‘s website has some very nice photos of before and after repair. This edition (222) of SurgeXperiences is hosted by bongi, other thing amanzi. You can read this edition here. surgexperiences 222... short and sweet. a masterpiece by a master writer. surgeons sometimes don't allow the facts to get in the way of their hard headedness. The host of the next edition (223), May 17th will be T from Notes of Anesthesioboist. The deadline for submissions is midnight on Friday, May 15th. Be sure to submit your post via this form. For the 17th year, the National Association of Letter Carriers will be collecting non-perishable food items like canned meats and fish, canned soup, juice, pasta, vegetables, cereal and rice in their yearly drive to “stamp out hunger.” This year the date is Saturday, May 9th. You and I can help by placing food donations at the mailbox on May 9th before the letter carrier arrives. The food donations will then be taken to the Post Office. Later it will be delivered to local food banks or pantries. Please make sure the food items do not have expired use dates. They also ask that there be no glass containers. Last week began the story of this quilt. 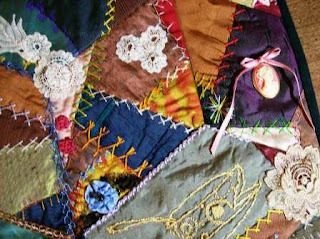 It will be entered into a crazy quilt contest to benefit the Alliance for American Quilts. 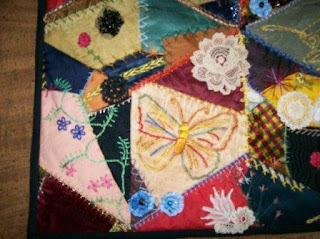 Here is my crazy quilt pieced together from the old one. It is 16 in X 16 in as the rules demand. 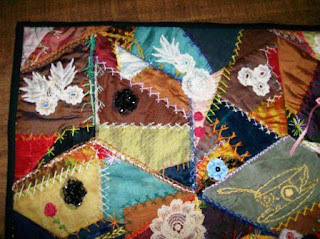 Here is the quilt after I finished adding more embroidery and embellishment. And here are some detail photos of the work.